We had a fantastic time at DeveloperWeek in San Francisco last week! 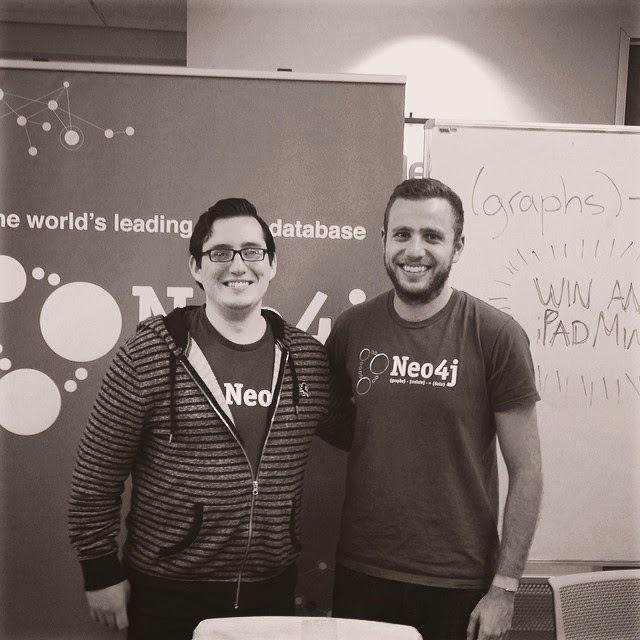 It was great to see so many graphistas attend events around the city, which resulted in an awesome week connecting with the local Neo4j ecosystem. We kicked things off on with our (Neo4j) – [:POWERS] – > (love) meetup on Wednesday, Feb. 12 at EngineYard with presentations by Andreas Kollegger, Amanda Laucher and Felienne Hermans. Next up was the 30-hour DeveloperWeek Hackathon, which started on the morning of Saturday, Feb. 15 and continued until Sunday evening. Teams competed for various prizes including a $150 Amazon gift card per team member for most innovative use of Neo4j in a submission. We thoroughly enjoyed seeing all of the different apps applying a graph database, but we could only choose one winner: Enter AirShare. AirShare is an application that allows you to trade seats with other people on your upcoming flight in order to have more room. The Neo4j judges thought this was an innovative use of Neo4j to graph out the connections between passengers and estimate the optimal seat plan for a group of people on a flight. The conference portion of DeveloperWeek 2014 began on Tuesday, Feb. 18 and Neo4j hosted a booth in the expo hall where we meet a lot of graphistas and introduce graph databases to conference attendees. On Tuesday afternoon, Neo Technology CEO Emil Eifrem presented a talk titled “Addressing the Big Data Challenge with Graphs” on the main stage and also participated in a panel on Next Gen Data Dev. During the panel, Emil spoke on the future of the database space and how one database is not a one size fit all for a solution. The consensus between the panel participants was that a combination of data driven solutions is the best way to tackle big data problems. On Wednesday, Developer Evangelist Kenny Bastani presented his “Building Killer Apps Using a Graph Database” talk, which introduced a solution for easy app development on top of Neo4j. His slides are available here on Slideshare. Over 100 people attended our GraphPUB SF on Thursday evening at Thirsty Bear Brewery! We had a graph-tastic time discussing all things graphs and modeling graph domains on paper tablecloths with local graphistas and DeveloperWeek attendees. We also heard lightning talks from local graphistas including Dan Tennery-Spalding who modeled the domain of ski runs and lifts in a graph and Mat Tyndall who demonstrated his work with Swagger, an API authoring application exclusively for Neo4j. We hope you had fun with us during all of the DeveloperWeek SF festivities! We certainly did and we’re already looking forward to more conferences, meetups and other events in 2014. Click here to check out all upcoming Neo4j events.